Hello Zoe! Really beautiful shot of such a beautiful place. I really love the use of natural bright lighting to backlight the three young men so that they are partially silhouetted. And then the light brightens the Taj Mahal, and gives subtle highlights on the right side of the kneeling or seated man at the left. 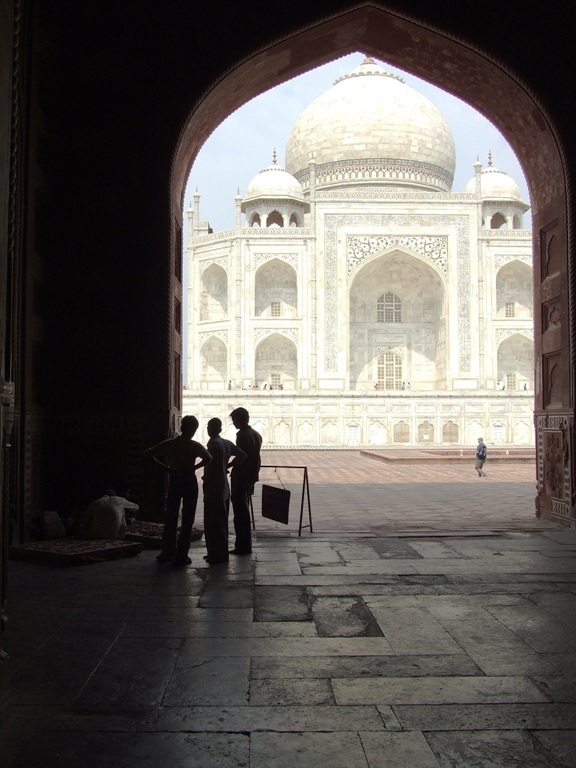 Excellent point of view to capture this, and I really like the strong composition and vertical framing, placing that beautiful pointed arch opening to the Taj Mahal at the right, balancing with the group of men at the left. Excellent the way the lighting hits the stone slab flooring in the foreground, bringing out its details and textures, and making the interior space look calm and grand. Nice too how the Taj Mahal gets its own frame within a picture, with the red-brown arch. Amazing perspective, depth, and scale too with capturing the man walking in the far background outside at the right, balancing with the men closer to us. I am posting a workshop of this since I find the Taj Mahal itself to be so exposed or bright that it loses some tonality. Hope you will like it! i love the composition, and here's why? - there are silhouettes of people in it, another fav! I'd use a lower POV to take the whole dome and a smaller aperture. Also b&w or sepia works better. Twoje zdjecie ma naprawde wspanialy klimat. Nice perspective and contrast of dark and white, shadow and light. You have expressed evaporate of beauty by beautiful building, Taj Mahal behind dark arch. Well done.